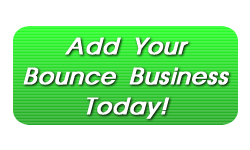 Moon bounce rentals and other inflatable party rentals for DC and Virginia and Maryland suburbs. We have over 400 moon bounces, moon bounce combos, inflatable water slides and other inflatable party rentals. 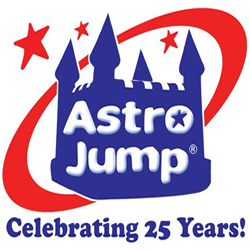 We provide free delivery for moon bounce rentals in Washington, DC and most Virginia and Maryland suburbs, including: Northern Virginia moon bounce rentals in Arlington, Alexandria, Ashburn, Centreville, Chantilly, Falls Church, Fairfax, Leesburg, Loudoun County, McLean, Reston, Great Falls, Springfield and Vienna. 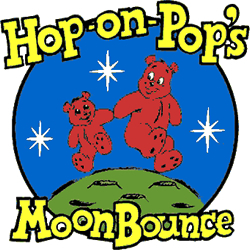 Maryland moon bounce rentals for Rockville, Bethesda, Chevy Chase, Gaithersburg, Potomac, Poolesville, Silver Spring and PG County. We are a Baltimore party rental and DC party rental company. 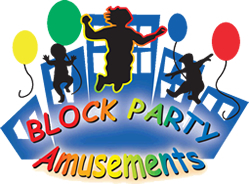 We have moon bounces, face painting, costume charaters (Sponge Bob, Spider Man and more), cotton candy, snow cone, popcorn machines. We bring fun to any event or party. One stop shop for all your party rental needs. We are a veteran and active duty military owned party rental company. Since 2005 we have serviced more than 15,000 events in Northern Virginia, Richmond, VA area, Washington DC and the Maryland counties surrounding the DC belt loop. We can provide the following services: Moon Bounce & Bounce House Rentals, Moonbounce & Slide Combo Rentals, Dry, Water and Slip ‘n Slide Rentals, Dunk Tank Rentals, Obstacle Course Rentals, Rock Wall Rentals, Trackless Train Rentals, Mechanical Bull Rentals, Sport and Inflatable Game Rentals, Cotton Candy, Popcorn and Snow-Cone Rentals and Backyard and Table Top Carnival Game Rentals. Maryland, DC, Virginia inflatable moonbounce rentals and party supplies. 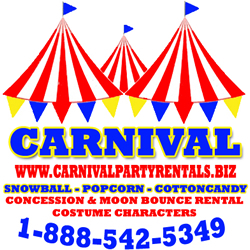 We offer moonbounces, concession machines, carnival rides, bumper cars, carnival games, tents, tables, chairs and tents. We service DC, MD, VA party rentals. DC, MD and VA moonbounce and party rental delivery service. We provide bounces, obstacle courses, inflatable combos, wet and dry slides, cotton candy machines, popcorn machines, snow cone machines and more. Free delivery to most areas. We are fully licensed and insured to handle your events public or private. We have over 100 inflatables in stock and ready for you.